Question: In today's climate of unbelief in so many circles, how wise is it to put on Holy Communion as the church's main service? Let's establish one thing from the start. 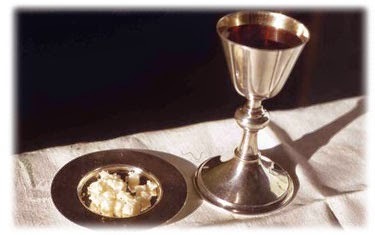 The Holy Communion, or 'Lord's Supper' as it has traditionally been termed, is - for those who love the Lord Jesus Christ - THE service, above all, that seems to bring the Lord very close to his people. After all, it was Jesus who instituted this Supper in the first place, adapting it from the Jewish Passover - which had commemorated the great deliverance of God's people from Egypt in a ceremony involving the sacrifice of a lamb. Now, on the eve of a yet greater 'deliverance' - as the sacrificial Lamb of God - Christ was to die on the Cross for the sins of the whole world. He never wrote a book, or left a monument to his name. He simply bequeathed to us this ordinance by which his memory and his presence would stay close to us - and by which the Cross would be seen to occupy the unmistakable centre of our life and our mission to the world. Without this service, we could so easily drift from this conviction. Yet it may legitimately be maintained that, while the Communion service is certainly the most important meeting point for the members of any church, it is not necessarily the most frequent. The reason becomes apparent once we think of the needs of the non -members. Our mission is to a world that, for the most part, is rejecting the claims of Christ to be its Saviour. 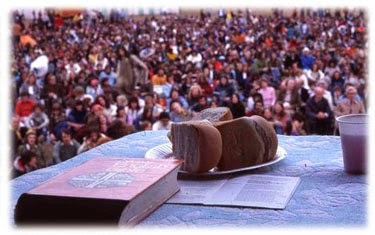 Once we take in that the Holy Communion is primarily a service for the Insiders - for those who already know and serve the Lord - our thoughts inevitably must turn to the needs of those who have yet to put their trust in him, and who in the very nature of the case could not possibly receive the bread and cup in any meaningful way. Naturally, such might well find themselves walking into a service of Communion - only to find themselves immediately in the category of non-participants at the vital moment. Or worse still, partaking undiscerningly (1 Corinthians 11:27 -32). The Anglican reformers, through whom the Church of England Prayer Book came into being some hundreds of years ago, were well aware of this issue. What more natural, then, to set out in the Prayer Book the provisions for the regular Sunday by Sunday service of Morning Prayer? In this public service there was no obvious moment when an unbeliever could say, 'This bit doesn't involve me.' All could have access to the worship and prayers, the exposure to the hymns of the church, the reading of Scripture, and - very importantly - the exposition of the Bible in the sermon. Without the time restriction imposed by the Holy Communion liturgy, enough space was available for ample Bible teaching to be imparted. The great historian G.M. Trevellyan wrote of the seventeenth century that the effect of the public study and teaching of the Bible "upon the national character, imagination and intelligence for nearly three centuries to come was greater than that of any literary movement in our annals or any religious movement since the coming of St Augustine" (History of England, Longmans, Green & Co, 2 nd ed, 1942, p.367). Friends, this is where we are missing out. We are faced these days in the West, not so much by a 'post-Christian era' as by what is fast becoming an altogether new 'pre-Christian era.' We are back with Paul of Tarsus in Athens all over again. Superstition and plain ignorance confront us at every turn. There is a call today to be putting on - at a much greater frequency - the modern update of the old Morning and Evening Prayer - in what might be termed 'Bible services'..for that is basically what Morning and Evening Prayer had been in the old Prayer Book. It is not just that the unbelievers need such ministry; so do the regular church members! We have today in our churches as untaught a generation as we have had for several hundred years. Naturally the saints of God are going to value the special times of Holy Communion. But let them be 'special'! Two hundred and fifty years ago a mighty revival broke out in Yorkshire under the inspired Bible preaching of the Anglican vicar of Haworth, William Grimshaw. It was the Bible that did it. Grimshaw knew his people well, and decided that - as far as the precious service of Holy Communion was concerned, he would put on such a service once a quarter. It was not that he despised the Lord's Supper; on the contrary for several Sundays before such a service he would preach his way up to it, laying upon his members the vital centrality of the Cross and all that it meant. Then, when they came together, what a time they had! It was said that the size of the crowds - overspilling into the churchyard - necessitated the using of some thirty bottles of Communion wine for a single service. We may not feel obliged to go to these lengths. 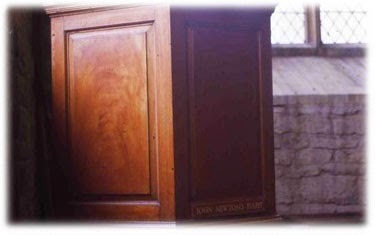 But it is worth considering whether - by organising services of Holy Communion as the most regular main church gathering - we may not unwittingly be cutting down the numbers of those who might otherwise have been touched and won to an informed faith by the holding of services more specifically targeted to the teaching of the Bible - to all comers!